Craig asks: Do chicken egg whites really help heal burns? Craig, I’ve actually had a couple of people try and convince me of this in the past. A quick Google search will yield several, not so reputable, websites claiming this is true; but the short answer to your question is, “No. Egg whites do not help with burns, and they can actually make the situation worse.” As many know by now, and some lament, I’m not one to say something here without giving the long, medically detailed answer- occupational hazard to being a nerdy paramedic. So you can either take my word for it, or to truly understand why egg whites are not a great choice for burn treatments, read on and let’s look at what we’re trying to treat when burned, and what’s in egg whites to see if that helps. On the surface, this theory does seem plausible. The egg whites are made mostly of water (90%) and numerous proteins (10%) like albumin and globulins. Cooling with water is a well known and time tested treatment for pain relief associated with minor burns. Most egg whites tend to be cooler than the area being burned, so that only leaves us with the proteins to consider. So now let’s look at burns and what we’re trying to treat and see if the added proteins to the water are more helpful than plain water. There are several types of burns, including chemical, electrical, friction, radiation and thermal (both hot and cold). No matter the cause of the burn, the result can leave the skin and underlying tissues, extremely damaged. When it comes to the severity of the burn, they are separated into 3 main classes, denoting the depth of the burn. First degree burns involve only the outer layer of the skin (epidermis). Second degree burns involve both the epidermis and the layer underneath (dermis). Third degree burns involve the epidermis, dermis, and the muscle tissues underneath. Some medical professionals have advocated for a 4th degree that denotes when the person’s bones are also burned. This hasn’t seemed to gain much traction in most medical circles though. The focus on treating burns revolves around 4 main things. Stopping the burning (obviously), pain relief, infection control, and warding off dehydration and hypothermia. The skin is a fantastic organ that’s responsible for protecting our bodies from outside pathogens like bacteria and viruses. It also helps keep our precious body fluids in place and gives us a nice bone blanket to keep warm. When the skin gets damaged, it can no longer provide us with those benefits. It’s no surprise then; infection dehydration and hypothermia are the most common lethal complications of burns. For instance, infection is the leading cause of death in burn victims accounting for approximately 10,000 deaths per year in the United States. Now that we know what we’re trying to treat, let’s see if egg whites help. Stopping the burning- When it comes to chemical burns, egg whites definitely won’t help. To stop the burning, you need to brush the chemical off and then flush the area with copious amounts of water to get any microscopic material left. Obviously egg whites will do nothing to stop electrical, thermal, nor friction burns either. Unless, of course, you have something like a bathtub filled with egg whites for the burning person to jump into, but that seems a bit far-fetched. In the end, egg whites won’t stop the burning processes. Now that one’s somewhat obvious; what about pain relief? Pain relief- Third degree burns have damaged the nerve cells so badly that the areas affected by these types of burns don’t hurt, so we’ll focus on 1st and 2nd degree. The only study I was able to find that looked at treating burns with both water and other substances, including egg whites, was done in Milas, Turkey. The results of that study showed subjects treated with egg whites had no greater decrease in pain compared to those who used only water. While many substances that are cool and cover a burn area will provide some pain relief, numerous studies have shown the use of most home-burn-remedies to treat burns greatly increases your chance of complications, compared to those using only water. In the end, even though you might get some initial pain relief from applying cold egg whites on minor burns, water does the same thing, without all the complications, which I’ll talk about shortly. Infection control- Infections are the leading complication associated with burns. Because of this, they’re arguably the most important thing to consider when treating someone who’s been burned. The proteins in egg whites do nothing to help with infection. In fact, they will most likely increase the chance of infection as egg shells, yolks, and whites all can contain numerous types of bacteria including salmonella. So if you thought egg whites might help with infection, they actually do the opposite. Dehydration and hypothermia- Dehydration is a big concern for those treating burns. A person whose skin has been damaged will begin leaking fluid from their bodies. Not from their vascular system, but from all the areas around your cells, organs and blood vessels, known as your interstitial space. Once that fluid begins to be lost, you will start to draw fluid from within your cells, organs and blood vessels, further complicating the dehydration. This is such a concern, due to the amount of fluid burn patients lose, there is a standard formula for how much you need to give them. Known as the Parkland formula, you take the patient’s weight in kilograms, multiply it by 4 and then by the % of body surface area burned. Half of that volume will need to be given in the first 8 hours and the other half in the next 16 hours. For example, a 180 lb person (82 kg) who has about 50% of their body area burned will need ((82 * 4) *50)/2 = 8200 mL = 8.2 liters in the first 8 hours and the same in the next 16. For reference, that same person has only about 5.4 liters of blood volume. Egg whites will certainly not help with rehydrating someone, and since we’ve already discussed that it’s a cooling substance, it’s not going to help them with hypothermia either. The last vestige of this myth is one where some people say it helps with skin regeneration. The problem with this thought process is how skin repairs itself. In order to not make this article too much longer, if you’re interested, for a full explanation on how the skin repairs itself, you can read my article here: How Scars Form. The short version is that the proteins that are involved with skin regeneration don’t begin weaving their magic (they form in a basket weave appearance) until after a scab is formed. The scab will certainly prevent any egg proteins from assisting in regeneration. If it didn’t, bacteria would be able to enter and we would be back to the infection problem again. There you have it Craig, egg whites will not play a positive role in helping treat burns, particularly not over something like water, though, of course, they’d be better than something like, say, treating a burn with battery acid… But, over simple water, the egg whites might even just make it worse. In 2012, there were approximately 450,000 burn victims in the United States that required medical treatment. 40,000 required hospitalization and 30,000 of those required a burn center. As of 2012, there were 127 burn centers in the United States. They received over 60% of all hospitalizations related to burns. They each averaged approximately 200 admissions. The other 4,500 acute care hospitals handled the rest. 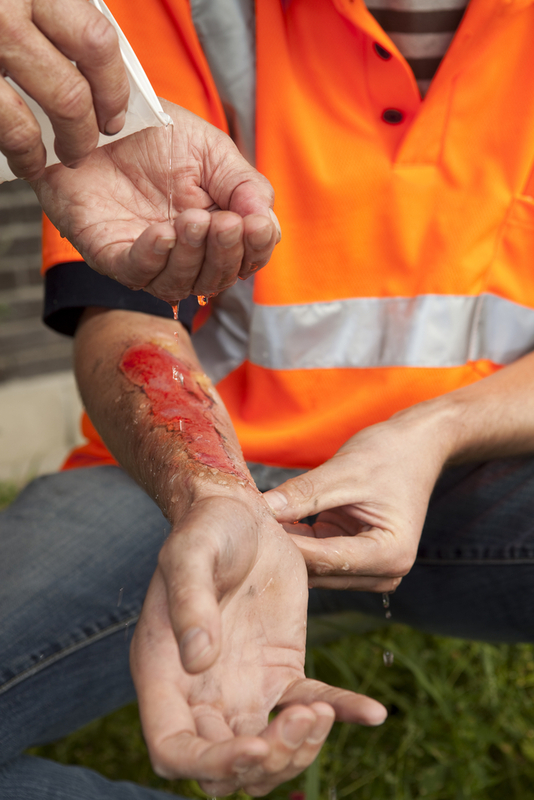 In 2012, the survival rate of burn injuries was 96.1%. 69% of victims were male and 31% female. 69% occurred at home, 9% occurred at work, 5% occurred during recreation or sports. 44% of those burns came from fires or flames, 33% came from scalding, 9% were contact burns, 4% were electrical and 3% were chemical. I was surprised to see that you did not mention using Aloe Vera as a topical treatment for burns. @Christine: While I can’t specifically speak for Scott, I’d guess it’s mainly because, to date, while there are some studies that show aloe is good for burns, the results across many studies show a lot of conflicting results and not much in the way of benefit, other than some cooling effect and the like, which is good but can be achieved by the more prevalent and cheap water. Also, most aloe products actually have a pretty low percentage of aloe and a lot of other chemicals, so that could be a concern too in some cases. High doses of aloe can also cause cancer when ingested (a common old usage of aloe was as a laxative). So for major burns, I’d think it wouldn’t be good to spread all over and get in your bloodstream, though that’s just speculation, as I know of no actual study that looks at aloe on major burns and cancer rates. You can read more about the controversy around aloe usage in a different article by Scott. Thank you for taking the time to put together this well thought article. The “egg whites for burns” story is floating around Facebook again, and someone is going to get hurt worse if they use that advice. I can vouch for the honey, as we used it on my husband’s burn last summer. i suggest u try the egg whites just once after u burn yourself. You will change your tune pretty quickly. Members of my family have been using this remedy for generations. Always reduces pain, speeds healing and prevents scarring. And none ever suffered infection as a result. It really is an amazing remedy. Agree with Annie. My nephew who was a chef used this remedy frequently with amazing results. The egg white, when dried, seals the skin from the air, and forms a protective layer. I have used this method for various burns received from hot things in the kitchen. It is much better than running cold water over the affected area. Shame to see such a well written understatement! I’ve had numerous minor to moderate burns and as long as I used the white egg substance immediately it always helped. First it removed all pain and swelling, and 2nd it speeds up healing much faster and in most cases prevents from burned skin turning into a scar. The white egg substance has a natural quality of absorbing heat (as you may know it helps to explain why chickens sit on those to make them hatch). As this substance absorbs heat, it literally “cooks” when applied to a burn as it absorbs all the heat from it. You have to make sure to keep rinsing the area once the egg dried on your burn and immediately re-apply more. Keep doing this for 3-4 hours and you’re done. Then you can create another post where you actually know what you’re talking about. This is article says it does not work? THAT IS NOT TRUE!!! Yesterday I burnt my finger taking a metal pan out of a 450 degree oven. The pad if my finger was BURNT. I heard it sizzle and the skin turned white like when you sear a steak. I ran cool water on it and then got an egg. I pulled that little piece of membrane from the top of the shell and laid it across the burn, then kept slathering the egg whites on it. I started looking it up on the internet and all articles say it doesn’t work . It did feel better so I just let dry on my finger. This morning I have NO BURN! It is not pink or any sign that it ever happened. I always assumes that the reason why egg white helped, was that it created a temporary skin to protect the damaged skin underneath. Kind of the same way the skin on a blister works. I have also heard of great things the Russian’s are doing with potato starch as a replacement outer skin while the skin recovers. I have read everyone’s responses with interest. One thing is missing – that place in science where you undertake tests to make comparisons. If something ‘worked for you’, and you tried only that method, then it follows correctly that it worked, for you. What you didn’t do was employ any other method at the same time and in the same place to compare the efficacy of each. If I sprain my wrist and wrap it in cabbage leaves for 48 hours, keeping it immobilised, can I really say the cabbage leaves were a magic cure for sprained wrists? What if I used a silk scarf, an old woollen sock, or a bandage? None of these would help if I didn’t immobilise my wrist, but all could be cited as effective otherwise.Rigorous testing and observation produces knowledge we can trust, and one size does not fit all. I burned 3/4 of my face. However, it was a first degree burn. Egg whites healed my face to the point that you can never look at me and tell my face was once burned. I was spray painting near a candle…the explosion sigened my eye lashes off and burned my forehead completely, both checks and the tip of my nose. Maybe egg whites are only effective on first degree burns. Egg oil was traditionally used in treating wounds and injuries. In the 16th century, Ambroise Paré used a solution of egg yolk, oil of roses, and turpentine for war wounds, an old method that the Romans had discovered 1000 years before him. He published his first book ‘The method of curing wounds caused by arquebus and firearms’ in 1545. There is proximately 11 times more omega-6 based tissue in the human body than Omega 3, and there is virtually no omega-3, human skin is all omega-6 based tissue as is the human arterial system, omega-6 linoleic acid is critical for arterial flexibility and resilience which maintains proper blood pressure, arterial dilation and blood viscosity, circulatory speed and flow. I have tried many things for kitchen burns , but it is egg whites that have saved me from scarring and takes away the burning sensation fast , I keep reapplying the egg white throughout the day, sometime I just smear a bunch of egg white in a paper towel and wrap my burnt finger in it next day no scar, no blister., finger is healed totally amazing nothing short of miraculous. Egg whites work on burns people. And I mean REALLY work. The fact that someone hasn’t sat down to compare evidence and do research does not make it any less effective. Besides, what pharmaceutical is going to spend millions on research to prove that a cheap egg from your fridge is the best remedy for burns? My evidence is this: burn myself, don’t use egg whites, long period of pain, blister and scar. Next time I burn myself, use egg whites, almost instant relief from pain, new pain once whites have dried, reapply, and so on. No blister, no scar. Don’t knock it ’til you try it. Actually they also take down a high fever when applied to soles of feet. The feet literally start to get hot after application so clearly something in that stuff removes heat. This is so false. Egg whites relieved a horrible burn I got on my fingers/hand while cooking. NOTHING would take away the pain – not vitamin E, not ice, nothing that usually worked. I was up the entire night hysterical – the burning was so so intense. I read online about egg whites, and figured, what do I have to lose? Well, within SECONDS of immersing my hand/fingers in the egg whites, the excruciating pain was COMPLETELY GONE! Also, the blistering stopped and I had NO scarring whatsoever! I also healed so quickly – in just a few days! To say that egg whites is no different from water is an asinine statement. You are small minded and your ignorance has the potential to steer people away from a natural miraculous remedy. Clearly, I have nothing to gain by posting this – it’s not like I own a patent on egg whites! I am writing this to let people know that you don’t know what you’re talking about!! Does egg cause any infection if it pit it on burns?